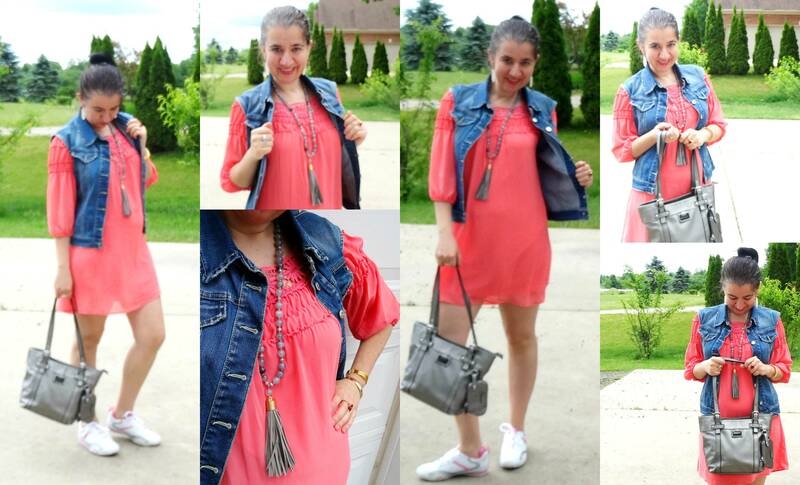 Coral Dress topped with Blue Denim Vest. Happy Hump Day Housewives! OK, I never say Housewives, but I was trying to do an alliteration. LOL Anyhow, this is the fourth dress for the Bright Dresses for Summer edition and the 11th outfit featuring a Dress - since I am wearing a Dress into a different outfit each day of June. You have seen some Coral Dresses and White Sneakers lately, on the blog. Examples of Coral Dresses here and here; examples of White Leather Sneakers here and here. Today, I have yet another Coral Dress on and paired it with a new/different pair of White Leather Sneakers who are partially perforated. You may remember this Baby Blue Chiffon Babydoll Dress from a couple of weeks ago. 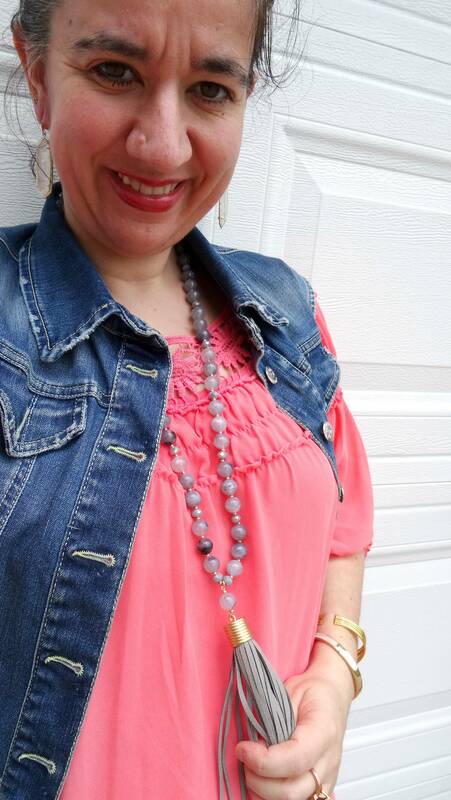 Today I have on a brighter-colored version, this coral one. Hey, for 25 bucks these cute dresses are a steal. I love the neckline, not just because of the crochet floral detail around them but because they are in a boat style and you could try wearing these dresses slightly off-shoulder. 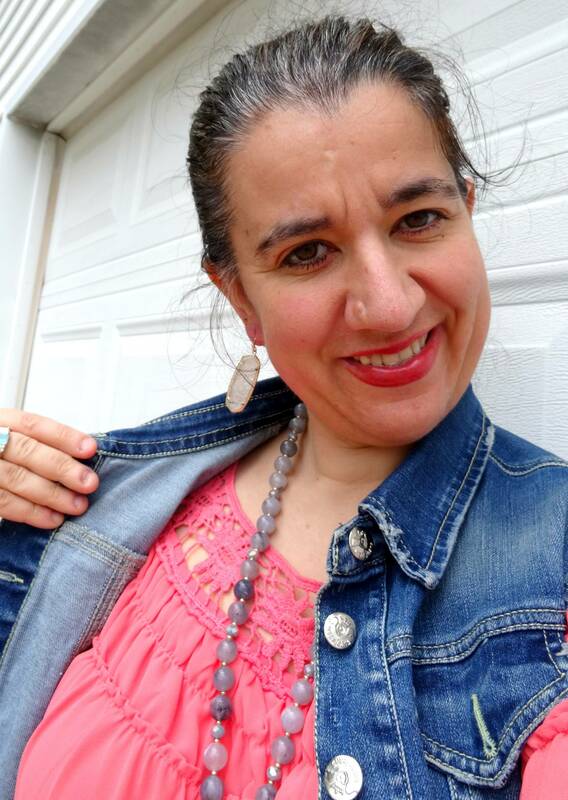 When I wore my Baby Blue Dress, right after editing the pictures, I thought I would try it with my Blue Denim Vest next for a tone-on-tone look. 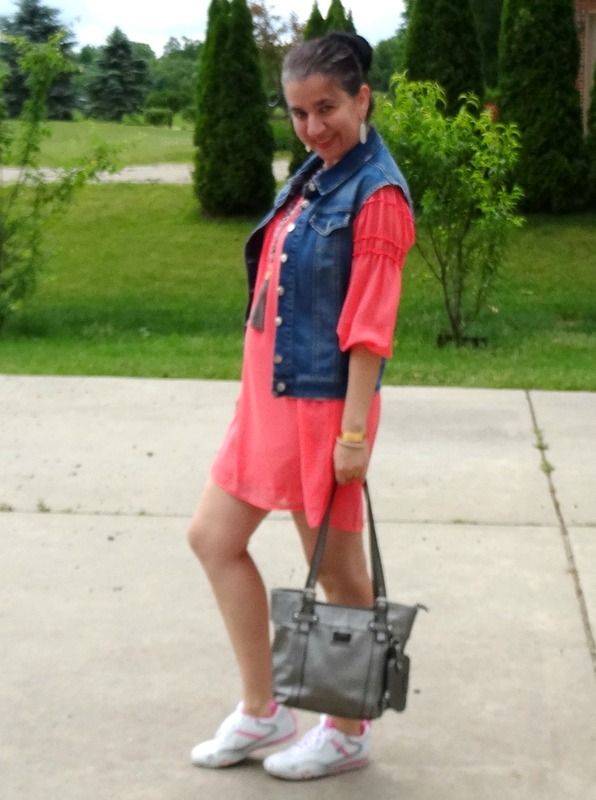 This style of a dress looks great with a vest so I tried the Denim Vest over the Coral Dress instead. On the plus side, the vest kept me warm because it was about 68 degrees. I styled the dress and vest with a Gorgeous Gray/Silver Beaded+Suede Long Tassel Necklace by The Jacket Society which matched my Pewter/Dark Gray Metallic Purse, nicely. 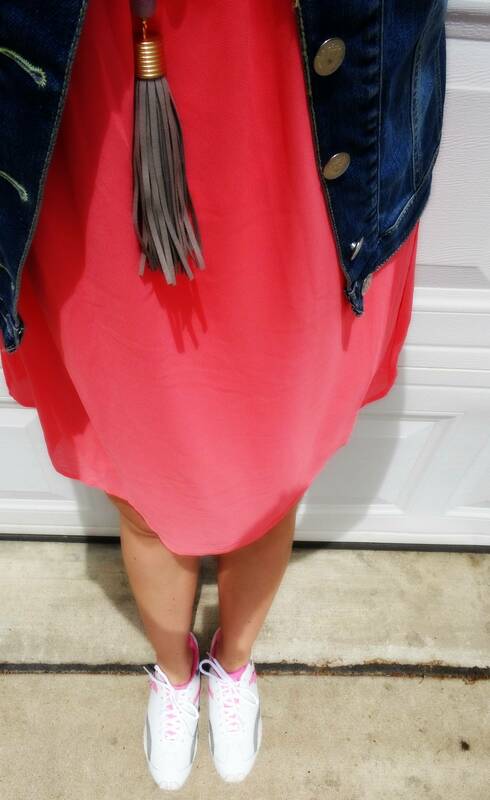 Also, the little pop of pretty pink from the white sneakers meshes well with the coral color of the dress. Overall a cute, sporty look which I wore to work on a weekend and got lots of compliments on. Are you wearing Cute Girly Dresses with White Sneakers, this Summer? Coral Babydoll Chiffon Dress w/ Crochet Neckline & Puffy Sleeves: 3 Hearts via Target.com (New) (similar, Steal), (similar, Great deal), (similar gorgeous option, small Splurge, my Favorite), (dressy, sleeveless lace option, Splurge, love this). Denim Vest in Medium Wash Blue: c/o Pelinki (similar, Steal), (similar, love this), (similar, Splurge). 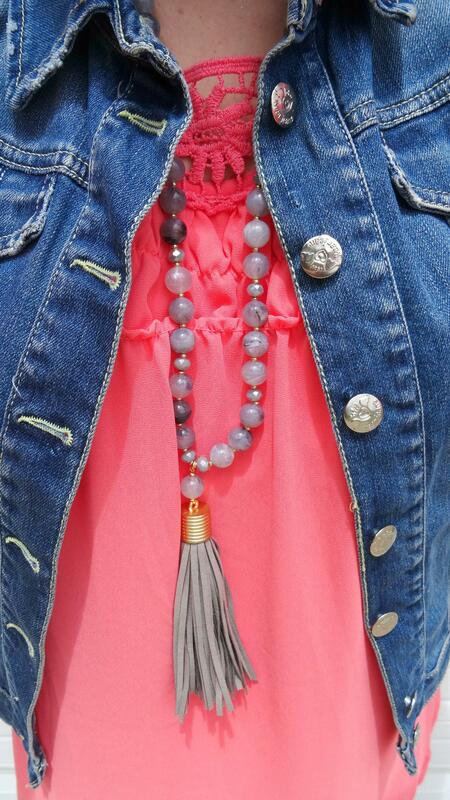 Long "Y" Beaded Gray Necklace w/ Suede Oversized Tassel (comes with earrings): Jacket Society (New) (identical, Great Deal), (similar, Steal), (similar, small Splurge, love this), (similar, Splurge). Pewter/Dark Silver Metallic Soft Leather Bag w/ small Pouch: Rosetti via Marshalls (shiny fun option), (bucket style, on Sale, my Favorite), (similar, Splurge, love this). White Leather Perforated Sneakers w/ Pink Cushion Lining & Pink Side Stripes: Tommy Girl by Tommy Hilfiger (similar, Steal), (similar, Great Deal, my Favorite), (similar, Splurge). P.S. Linking up with Alice, Allison, Amanda, Brenna with Grace + Jenna, Brooke with Erica, Carrie with Jill, Claire, Elle with Jacqueline, Elizabeth, Grace, Jalynn, Katherine, Lauren, Leeanne, Linda, Lindsey, Lisa, Liz, Madeline, Monica, Nicole, Rebecca, Sarah, Mix+Match Fashion, Stephanie with Jessica, Michelle + Whitney, Tara, Vicki, Victoria and Whitney.